The yearly religious trip to Shiloh was a particular trial to Hannah, it seemed. 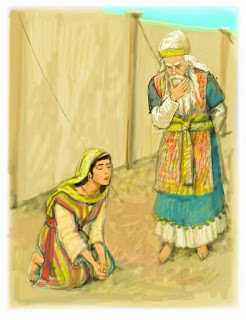 For not only did she have to watch as husband Elkanah gave portions to Peninnah and all her brood and receive a double portion from him herself (something that only made Peninnah's razzing and pestering of Hannah over her barrenness worse), but it was also a reminder that God appeared to dislike her too. For why had He not allowed her to conceive? On this particular day, Hannah could take no more. So she went alone to the house of the Lord (the tabernacle) to pour out all her frustration and desperation to God. She prayed. She wept. She made a big promise. And then Eli came up to her and accused her of being drunk! Oh no, she said, I'm just so sad. Then she went on to explain her situation. Of course Eli saw her genuineness then and said a wonderful thing to her: "… the God of Israel grant your petition which you have asked of Him" - 1 Samuel 1:17. Hannah reacted (went away happy) as if God Himself had spoken. But why? Nothing had changed had it? Not yet. But she believed it would. Her happiness was the result of FAITH, that considered what God promised through Eli as good as done. For what do you and I need faith today? "Now faith is the assurance (the confirmation, the title-deed) of the things we hope for, being the proof of things we do not see and the conviction of their reality—faith perceiving as real fact what is not revealed to the senses" - Hebrews 11:1 AMP (emphasis added). PRAYER: Dear God, please help me to leave my issues with You as completely as Hannah did, knowing that You can and will handle things. Amen. What do you know about your inheritance?